September is here, kids are back in school, and the weather is getting very comfy – despite some big rains the last day or so. There are still plenty of summer-type activities to enjoy as we dive headlong into the heart of September and some of the most scenic times to travel Wisconsin highways! The leaves will begin changing soon, too. 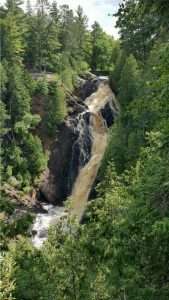 Wisconsin’s highest waterfall, Big Manitou in Pattison State Park off Highway 35 south of Superior. Check out plenty of great events, including Sputnik Fest in Manitowoc this weekend, ride the Great River Road along Highway 35, or check out the fourth highest waterfall in the country east of the Rockies. Visit attractions like the unique Johnson Wax Research Tower in Racine, designed by Frank Lloyd Wright (Wisconsin Highways 11, 20, 32, 38, I-41/94; the National Freshwater Fishing Hall of Fame in Hayward (Wisconsin Highways 27, 63, 77); the John Michael Kohler Arts Center in Sheboygan (Wisconsin Highways 23, 28, 42, I-43); beautiful Willow River State Park just outside of Hudson (Wisconsin Highways 12, 35, 64); or the Wisconsin Maritime Museum and Rahr-West Art Museum in Manitowoc, home of the upcoming and unusual Sputnik Fest on September 9-10! This is just the start – there’s 54,000+ square miles of the state to explore. Pick Some Roads and GO!! Check out some great articles we have too, including 10 Quirky Street Names We Found in Wisconsin, 6 Cool Stops along I-94 bewteen Milwaukee & Madison, and more!